Fireplace Xtrordinair is finally making it possible for renters and condo owners to enjoy the warmth and elegance of a fireplace within the home with the portable 564 Electric. 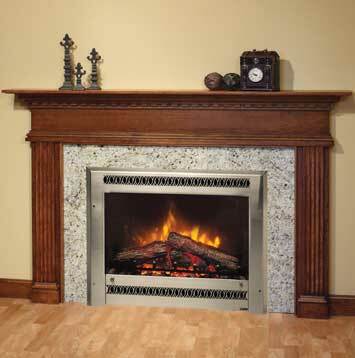 The fireplace is powered by any standard 110 volt wall outlet, no gas or venting required! A 5,000 Btu heater and air circulating fan with the ability to heat up to 400 square feet is standard in the 564 E for even heat distribution throughout the desired space. This feature makes the 564 E ideal for heating bedrooms, offices and other small places. A life like flame and fire can be viewed through the 564 square inches of high clarity glass. With lights built into the log set and a pulsating ember bed, the flames simulate a live wood fire. The intensity of the fire’s glow as well as the flame speed, accent light, sleep timer, room temperature, Purefire™ system, and power can all be controlled by a hand held remote. The same elegant, custom, high-end faces are available for the 564 E as the 564 SS giving each customer various personalization options. Installation for the unit is minimal - usually under one hour; and operating is economical costing only 3 cents an hour to burn or 8 cents an hour with the use of the circulating heater. The air cleansing Purefire™ system is another feature on the 564 Electric. The system circulates as well as cleans the air 4 times an hour in an average room, removing any impurities from the atmosphere. Enhancing your life with the 564 E.
Now add the beauty and convenience of the 564E into an existing fireplace. The NEW 8 inch Panel Set allows you to convert the 564E into an insert that is designed to fit most masonry or ZC fireplaces. Copyright © 2019 - Cedar Hearth / Mick Gage Plumbing & Heating, Inc. | All Rights Reserved.